FSXA New way to make light splash. I am glad you like it. It is easy to make. But in P3D you need a new set of darker texture. It is always too bright in P3D, even it looks perfect in FSX. Question, does anyone know why these 3D lights don't display the "splash" on the ground in P3D V3? I load them and only the top portion of the light shows (the bloom), but no splash on the ground. If I load Instant Scenery 3 and open the bgl library that has the lights then the splash shows up correctly. Interesting enough, when an object is loaded on Instant Scenery, all fog/shadow/crash/complexity settings are ignored for the rest of the session (I guess to make item selection easier), and textured transparencies become 100% specular. FSX and P3D V2 work great BTW. Tic, yes Indeed! I had to adjust the textures as you said once I saw them on V3 the first time! 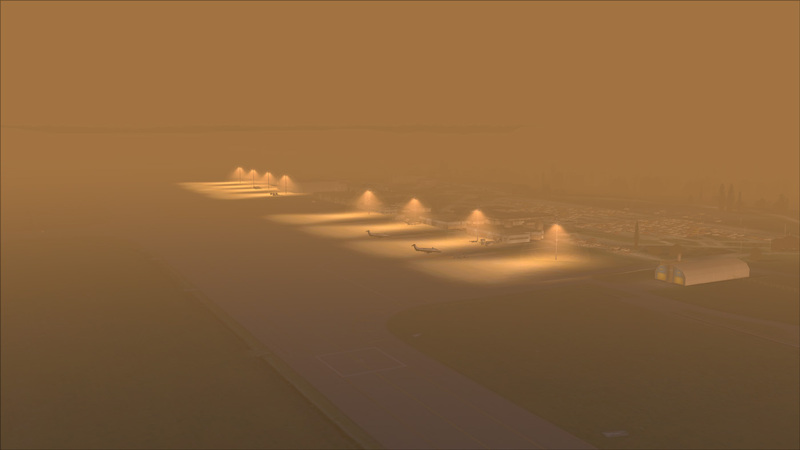 My lights is flickering to the ground, i set the position of the light plane to 0.1 again its same, gp is 0.00 height, also i tryed with LODs and it looks good to 20000 feets approx..Above 20000 is flickering, any solution ? I saw in Belgrade X scenery from 40000 feets is good and above .. Thanks !! I think I have found a convenient way to solve all the bugs with light splash. You first need to create an effect with FSXeditor. I'll save you the work and give you the effect parameters I used in this example. I modified the .FX settings in order to get the effect to turn on the user's position. The above effect is just an example. You can do whatever you want of course. Be sure to read the SDK help about effects. It is quite simple to create an effect, the SDK is very helpful. I did not see any FPS drop when using effects for light splash (but I admit this was only tested on a small airport). I'm sure we can make the light splash look better than in my example. Please see attached my effect settings. If needed I can create a new topic about this solution with more details. I am keen to learn the way of doing this. Could you create a simple video how you have done this? That will make me to follow the steps easier. I am using blender as my modelling software. I know this is quite an old topic. I still have problem with too bright light from one-one blend. I was wondering if you need to adjust other material properties as well... such as light bloom or other things. Really? I don't think I have alpha channel in the texture. I will try that. SrcColor -> one sometimes works for me. But I have tried in P3Dv4, it became too bright. I think the main cause of this issue is P3Ds HDR. The nice glow from One/One becomes a hard-edged solid color.  I found that using One/DestColor gives a very nice glow (as I pointed out in this thread), however, when HDR is disabled the light all but disappears. I had to resort to going back to the original method and making the halos smaller. When HDR is off the glow looks as it should like in legacy sims. Do any others properties help with that problem, Mousy? Such as alow bloom, bloom floor... etc. No idea. I didn't experiment further. I think you should have an alpha channel to use the one,one optiosn or whatever else. I will try that. I think it might help with my problem. So here I am thinking that I had this all figured out, then I got reminded why a lot of big developers have moved on from FSX. These are light splashes using the One/One method. Works perfectly in P3Dv4 but not in FSX. They disappear not just behind clouds, but behind anything that is not terrain or autogen. 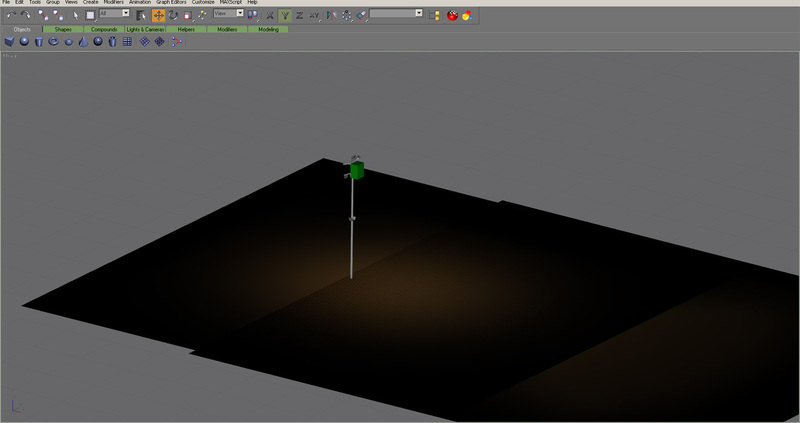 The "ground polygon" is a fully native FSX object placed with SODE so that it can make use of bump and detail mapping. I've tried all the Source/Destination Blend combinations I can think of. I've even tried a regular DXT5 material with some transparency and "Set Default Transparent". Each time it disappears. Weird thing is, another halo with an identical material setting as part of another model, does not disappear on the ground poly object. Anybody remembers how we used to make this work in FSX? I think it is the same in FSX. 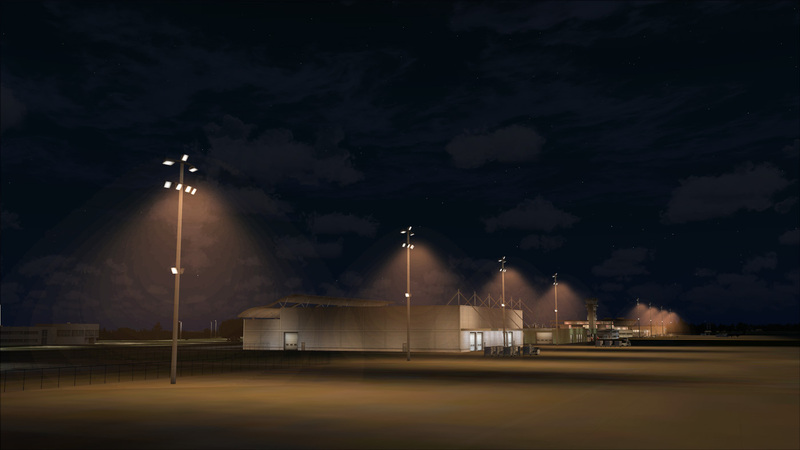 My ground poly is FS2002 style, so the light is visible above ground poly. I also use One-One method. I use it just only the taxi way lights. I used that once in runway guarding light and I got the same problem, the light is invisible. I use it for the light on the pole as well but only a small one not a light splash down to the ground. So the problem of disappearing behind the cloud is limited (not goes away but difficult to be seen). Is there anyway at all to get bump/detail mapping on a ground polygon/object in FSX without making halos disappear? Because I'm stubborn and refuse to use effects, I just spent the last 3 days thinking about this and I finally cracked it! I figured out how to get any One/One light/ground splash to appear over a native FSX material "ground polygon" in FSX with full bump and detail mapping included. 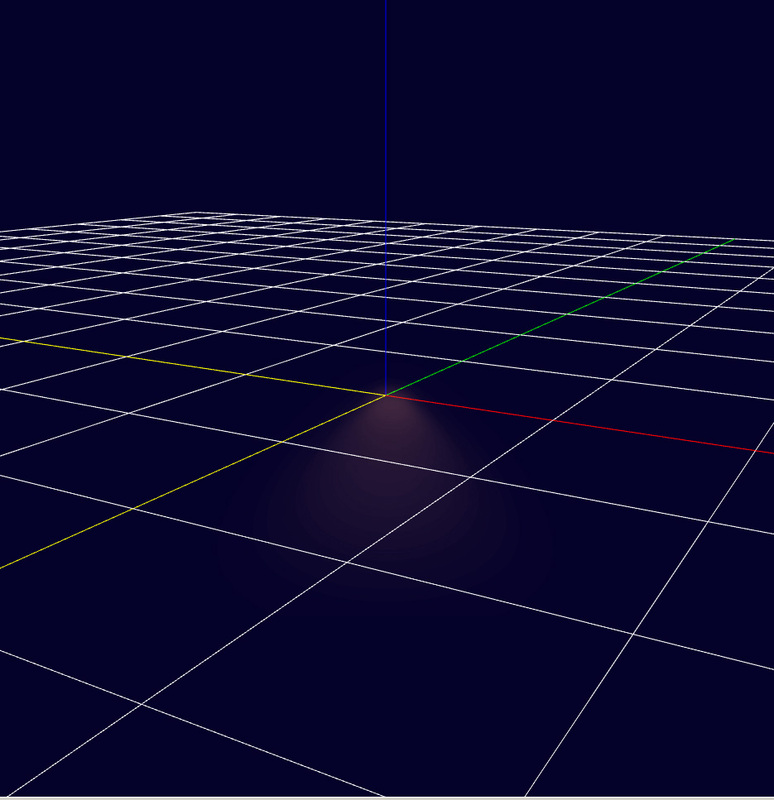 The trick is to have your lights and your ground polygon as part of the same object. Then place it using SODE as a simobject. I found that when the lights were separate from everything else, they disappeared behind other objects. This happened even when the lights were separate simobjects themselves. But I discovered that if a simobject model had a One/One halo inside of itself, it did not disappear behind any other part of that same model. 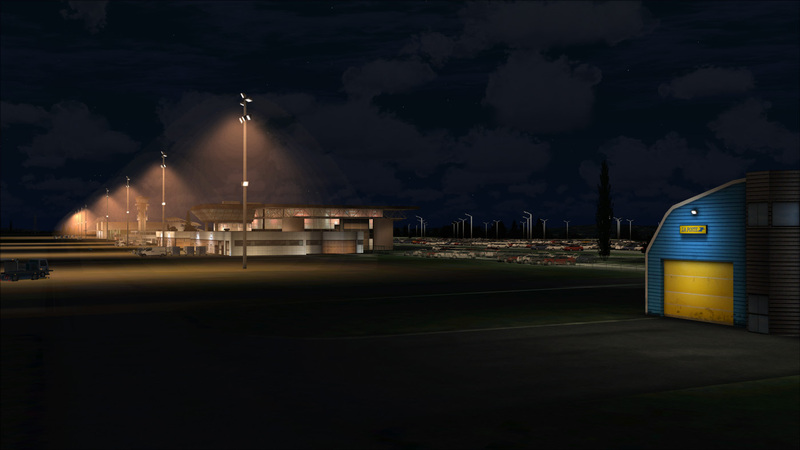 So i joined my ground poly, taxilight models, and light halos into one sim object model for use in the night. Then created another model stripped of the halos and ground splashes for use in the day. Then I used the conditional visibility options of SODE to control when each one appears. Using this method you can also add a condition for low met visibility. And guess what! 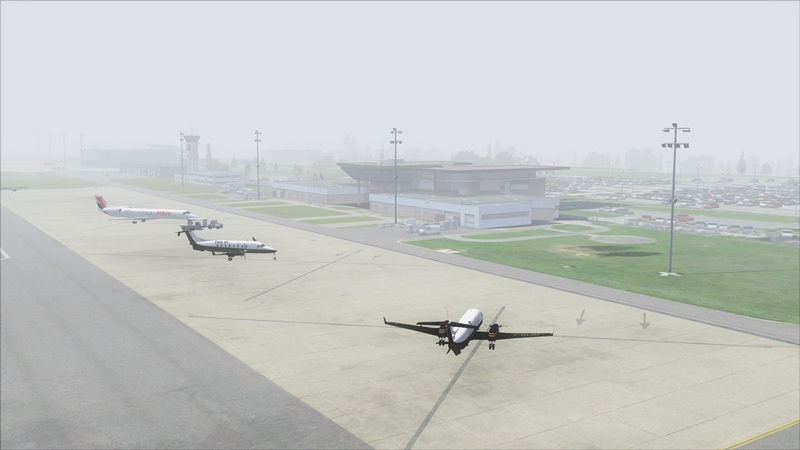 No annoying white models in fog either! No more choosing between working lights or working bump/detail mapped ground polys in FSX! That is a very good news. I will try that. I think it is the best way to do. By the way, FSX does not support native ground poly like this, does it? Since there is no Z bias in FSX, only in P3Dv3 or above. 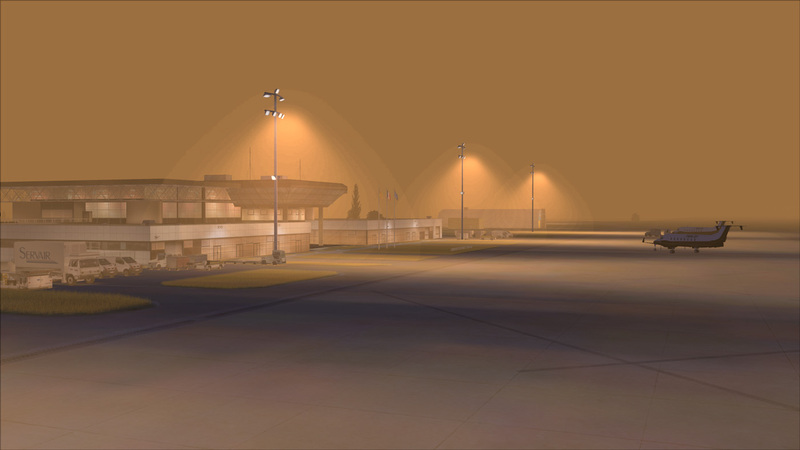 Not strictly as FSX Ground Polygon BGL, no; the detail/bump maps will be lost I think; but as a normal FSX MDL, yes. So the method I use is to create a P3D BGL from the GP Wizard of MCX (which saves all the detail/bump maps and Z-bias in the BGL) and then use MCX to convert that BGL to a native FSX MDL to the SimObjects folder of SODE. (You could just set the Z-bias yourself in the material editor instead of going through the GP wizard first, but I like using the wizard as it allows me to set the layers easily). SODE allows you to place the native FSX object and shift if up a certain distance (example 1 foot) when the user aircraft passes a certain altitude (example 1000 feet). This avoids all flickering when viewed from above (Except in zoomed out top-down view with the aircraft still on the ground, but I don't mind that).